Luxeon LEDs for 360 degrees of light. Lightweight and portable, durable rotating switch and a handle hang hook. 70 hour run-time on 4 AA batteries (not included). 40 lumens with a beam distance of 15 feet. Assorted colors (no color choice available). 2 ways to use: as a flashlight when expanded. Lightweight and compact size for easy storage & carrying. Convenient foldable handle for easy hanging. 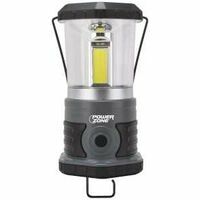 Great for camping or working in dark areas. Powered by 3 AA batteries. Batteries included. Convenient foldable hook for easy hanging, Magnet on back. 150 Lumens. 40 m beam distance. 1m impact distance. 8 hr run time. 3 W COM LED Wattage Ideal for application needing 360 degree illumination. Great for camping, working, writing, emergency. Plastic construction housing with carrying handle. Lightweight, compact size and collapsible for easy storage & carrying. Powered by 3 AA batteries included. 8 hr run time. Silvery black gun-metal finish. 250 lumens. 100 m beam distance. Luxeon LEDs for 360 degrees of light. Lightweight and portable, durable rotating switch and a handle hang hook. 70 hour run-time on 4 AA batteries (not included). 40 lumens with a beam distance of 15 feet. Assorted colors (no color choice available). LED Lantern. Push button switch. 70 lumens, 50 hours runtime, 90 meters beam distance, 7." length x 4.00" width.Assorted colors yellow, red, and blue. Uses 6 volt battery, included. Camping lantern. Side mounted 3 step push button switch, and a built-in hang hook in the handle for hands-free use. Amber LED nightlight. Requires 3 D cell batteries to operate (not included). 200 lumens, 39 hours run time, 30 feet beam distance, 360 degree light output. Plastic 4.75" W x 7" H, 9" with handle, .80lb. Soft silicone dome that squishes down when packed. 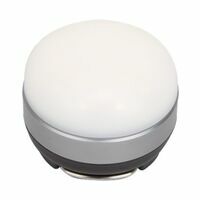 The multimode switch activates both high and low white LED modes and a red LED mode. 100 lumens maximum. Press and hold switch for red. It also features a sliding carabineer clip so it can be conveniently hung from the middle as a down-light or from the side so it's flat against a wall. Impact resistant (drop proof to 2 meters). Weather resistant. Powered by three AAA batteries (not included). Features an array of 24 high-quality LEDs in white and red, and a built-in hanger. Used in a variety of situations for both recreational and emergency use. Up to 60 lumen light output. Up to 50 hour runtime. Light output control with Coast Smart Switch. Light module protected by wire frame. Height: 7.5" / 19 cm, weight: 16 oz. / 453.5 g. Uses 4 C batteries, not included. Plastic, 60 lumens. Lightweight, durable and portable. Touching a finger to the top of the light turns it on and off. 3 "C" batteries (not included). Plastic, 60 lumens. Lightweight, durable and portable. Touching a finger to the top of the light turns it on and off. 3 "C" batteries (not included). Plastic, 60 lumens. Lightweight, durable and portable. Touching a finger to the top of the light turns it on and off. 3 "C" batteries (not included). Integrated carrying handle. Eight bright white Nichia LEDs one amber LED nightlight. Lifetime LEDs never need replacing. Pivots to light 180 or 360 degrees for task or area lighting. 52 lumens, over 245 hours run time on 1 set of four D batteries, not included. Typical weight is 18.5 oz. without batteries. Red color. 7.64" height x 5.40" width x 2.90" depth. Touch top operation. 100 lumens, 3 AA batteries (not included). Operates on a touch-activated, three-stage dimmer for varying levels of brightness. Carabineer clip handle to hang it as a lantern (with a down light when in lantern + flashlight mode) to provide full illumination of any area, or it can be collapsed with an easy sliding motion to become a bright handheld flashlight on the go. 200 lumens. Powered by four AA batteries (not included). Carabineer handle to clip, carry, or hang. Three adjustable levels, high, medium and low to provide intensely bright or softer lighting. Includes a protective carrying bag that doubles as a light diffuser. 400 lumens, run time of nearly 800 hours in low mode. Impact and weather resistant. Powered by 3 D-cell batteries (not included). Choose between flashing red, solid red, area light, and energy saving modes or select the preferred light level with the built-in dimming switch. Up to 375 lumen light output. Up to 80 hour runtime. Light output control with light dial. Battery-life indicator built-in to light dial. Handle allows easy hanging or carrying. Height: 8.25" / 20.95 cm, Weight: 32 oz. / 907 g. Uses 4 D batteries not included. Has the illumination characteristics of traditional gas / mantel lanterns without the safety concerns. Radiates 360 degrees of light. It is completely waterproof and submersible with an IPX7 rating, and it floats. There are 3 power levels: two globes and one globe output, and an amber night light, all controlled by a turn button. Two globe output is 400 lumens with 4 D batteries, not included and lasts 100 hours, with a 20' light output distance. One globe output is 50 percent less, and lasts 200 hours. The amber night light lasts 700 hours. Sturdy handle features a built in pop-out hanger hook allowing for hands free use. Lantern is 4.25" wide x 12.7" tall. Weight is 1.8 pounds. Spotlight head rotates vertically up to a 90 degree angle. Light can be adjusted from a 45 degree angle while holding the light to a 90 degree angle. The flat base allows the spotlight to stand for hands-free use. Made of rubber /plastic. 500 lumens, 587 meters. 5.5 continuous hours. 11.06" L x 6.410" W, 2 lb. with batteries. Locking trigger.